Tiny venetian box chain in standard 18 inch length. This fine jewelry chain is comprised of tiny folded box links made from silver strip material. Look closely to see the intricacy of the origami-like construction. These chains show more surface area than standard link styles so you can enjoy more silver flash on the neck. 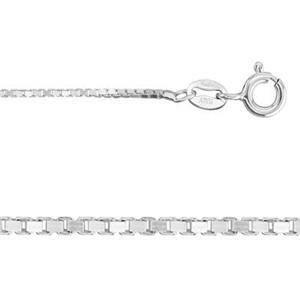 One of our most popular silver jewelry chains for many years.